Not sure you need an emergency fund? Imagine this: you’re going about your day, stressing about getting your notes together for a meeting later this week and just as you bite down on the apple you’re having for lunch, you feel this strange sensation in your mouth and then it hits you: your filling just came out. Not good – especially considering you’re the one giving the presentation in about 25 hours. So you make a quick call to the dentist, make a mad dash for his office and an hour later, you’re well on your way of righting things with your teeth. Meanwhile, your husband calls and leaves a message on your cell, “Had to take out $200 from the checking account for petty cash”. Two hours ago, things were moving along just fine and now, and what seems like a cruel joke from the money gods, you’re now the proud owner of a checking account that has less than $300. You walk in the door after wrapping up the day from hell and are met with, “Mom, I have to pay for softball camp tonight during practice.” Just when you thought it couldn’t get any worse, it does. Now what? An emergency fund is as crucial as electricity in your home. It serves a myriad of purposes: a sleeping pill so that you rest better at night knowing you’re prepared for the unexpected, a bargaining chip when you’re trying to wrangle a better price for that antique buffet and even an insurance policy for a marriage that doesn’t ever have to include fights about money (and remember – money is the number one cause for divorce in this country). Sometimes, life just simply gets in the way. An emergency fund is a practical decision that will affect your finances – hopefully, forever. 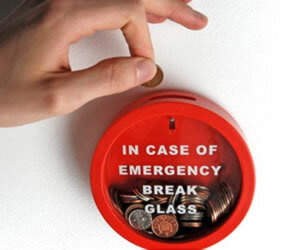 First, let’s delve a bit more into what an emergency fund is and what purpose is should serve. One of the biggest reasons why an emergency fund is a must have is it keeps you from adding to credit card debt. Instead of pulling out your MasterCard, paying cash for some things is just smart financial sense. Even if you enjoy a low APR, cash is king when it comes to unexpected expenses and the way to ensure that is to make a definitive effort of building that fund. Remember, too, that when you pay your credit card balance off, you can then use that money to pad your fund. Simply stated, your emergency fund is a stand alone account – it’s not your checking account or your primary savings account – to be used only in an emergency. Viewing it as “mad money” is going to be your first mistake. Don’t consider it as a vacation fund or to cover a party that’s just been dreamed up. Defining an emergency helps you decide when – if ever – you’ll use it. At a minimum it should be seen as a source to cover an unexpected but necessary expense. Jobs are lost every day, little ones get ear infections, fender benders are happening right this very second across the nation – anything like that counts. Now that you know what it is, it’s time to get started. First, you want to make sure you can access it even in the middle of the night. A savings account with a debit card should do the trick; however, if you’re not disciplined, you may wish to leave that debit card at home. In fact, many consumers do. The temptation is just too great. The amount of money required to fund a proper emergency fund is certainly significant, but we live in uncertain times with uncertain economies. Corporate loyalty is a thing of the past and unemployment can happen unexpectedly, usually at the worst possible moment. Make a commitment to grow your account. You might want to consider an electronic funds transfer with each payday. That eliminates you having to do anything. If you reach your ultimate goal, you can then decide whether to continue your contribution or ceasing it (though if you can afford it, there’s no reason why you shouldn’t continue your efforts). On the other hand, you might realize that since you’ve been able to painlessly add to that account, then you might be able to just switch the fund transfer to your retirement account or pay your credit card balances off faster. As you’re doing that, remember that paying your balance and having the emergency fund might mean less reliance on your credit card in the future. Now that you have your emergency fund alive and kicking, it’s time to really rethink your spending and budgeting habits. This goes hand in hand with your emergency funding efforts. Rethink your frivolous spending. That includes your morning coffees, the pay per view movie you’re thinking of watching tonight or those impulse buys in the checkout line at Wal Mart. Let’s say each week, you make twelve or thirteen dollars worth of frivolous purchases. That comes to about $650 a year. Think of how it would look in your emergency fund or as an additional mortgage payment. Rethink those open ended subscriptions: Amazon, Netflix, radio subscriptions and additional receivers on your satellite are just a few of the ways you can save money each and every month. Break up with your credit card. It’s a love hate relationship anyway. That’s not to say you should close your accounts, but you should learn to not rely on it so much. Pay down those balances and make up your mind that you’ll use it only when necessary. One exception: you don’t want a dormant credit card account to be closed, so a small charge here and there with the goal of paying it off when the statement comes in can actually help your credit. But again, your goal should be just to keep it out of dormant status. After all, being able to afford the payment is not the same as being able to afford the car. Besides, cars don’t keep their value. Finally, don’t forget the budget itself. Whether it’s a spiffy Excel spreadsheet, complete with pie graphs or simple lists in those old fashioned ink and paper things, make a budget, stay realistic and then stick to it.